We arrived at Paris’ Charles de Gaulle International Airport on a Sunday morning and, after checking in at the Ibis Paris Gare de l’Est 10th, we decided to hit two birds with one stone by taking the Paris Metro to get to the historic Notre Dame Cathedral, among the largest and most well-known church buildings in the world, where we plan to hear Mass and do sightseeing later. It was already raining when we left the hotel and, when we arrived,we still had to queue to get into the cathedral through the right door. The Gregorian Mass we attended was said in French. The magnificent, awe-inspiring Notre-Dame Cathedral, also called Notre Dame de Paris, (French for “Our Lady of Paris”) or simply Notre-Dame, is widely considered to be one of the finest examples of French Gothic architecture, its pointed arches, thinner walls and the naturalism of its sculptures and stained glass in stark contrast with earlier Romanesque architecture. The cathedral treasury is famous for its reliquary which houses some of Catholicism‘s most important first-class relics including the purported Crown of Thorns, a fragment of the True Cross, and one of the Holy Nails. The cathedral, with a cruciform plan, was made famous by Victor Hugo’s famous, larger-than-life novel “The Hunchback of Notre-Dame” (about the hunchback bell ringer, Quasimodo, who falls madly in love with the beautiful gypsy dancer, Esmerelda). Notre-Dame is composed of a choir and apse, a nave with double aisles and square chapels. It is 226 ft. high, 420 ft. long and has a total surface area of 5,500 sq. m. (interior surface 4,800 sq. m.). Construction of the cathedral began in 1163, during the reign of Louis VII. Bishop Maurice de Sully devoted most of his life and wealth to the cathedral’s construction. Throughout the construction period, numerous architects worked on the site resulting in differing styles at different heights of the west front and towers. The choir was built from 1163 until around 1177 and the new High Altar was consecrated in 1182. After Bishop Maurice de Sully’s death in 1196, Eudes de Sully (no relation), his successor, oversaw the completion of the transepts. He also pressed ahead with the construction of the nave which was, at the time of his own death in 1208, nearing completion. The western facade had also been laid out by this stage but it was not completed until around the mid-1240s. Between 1210 and 1220, the fourth architect oversaw the construction of the level with the rose window and the great halls beneath the towers. The cathedral was essentially complete by 1345. In the mid 13th century, the transepts were remodeled in the latest Rayonnant style and, in the late 1240s, Jean de Chelles added a gabled portal to the north transept, topped off by a spectacular rose window. Shortly afterwards, from 1258, Pierre de Montreuil did the same on the southern transept. Both transept portals were richly embellished with sculpture. The south portal features scenes from the lives of St Stephen and of various local saints, while the north portal featured the infancy of Christ and the story of Theophilus in the tympanum, with a highly influential statue of the Virgin and Child in the trumeau. In 1548, features of Notre-Dame were damaged by rioting Huguenots who considered them idolatrous. During the reigns of Louis XIV and Louis XV, as part of an ongoing attempt to modernize cathedrals throughout Europe, the cathedral underwent major alterations. In 1786, a colossal statue of St Christopher, standing against a pillar, near the western entrance, and dating from 1413, was destroyed, as well as tombs and stained glass windows. However, the north and south rose windows were spared. In the 1790s, during the radical phase of the the French Revolution , many of Notre-Dame’s religious imagery and treasures were either damaged, destroyed or plundered. For a time, Lady Liberty replaced the Virgin Mary on several altars. The 13th century spire was torn down and the statues of the biblical kings of Judah , located on a ledge on the facade of the cathedral, were beheaded as they were erroneously thought to be kings of France. Many of the heads were found during a nearby 1977 excavation and are now on display at the Musée de Cluny. However, the cathedral’s great bells managed to avoid being melted down. In 1793, the cathedral was rededicated to the Cult of Reason, and, later, to the Cult of the Supreme Being. The cathedral came to be used as a warehouse for the storage of food. In 1845, a controversial and extensive 25-year restoration program was initiated and overseen by architects Jean-Baptiste-Antoine Lassus and Eugène Emmanuel Viollet-le-Duc (responsible for the restorations of several dozen castles, palaces and cathedrals across France, he always signed his work with a bat). The restoration included a taller and more ornate reconstruction of the flèche (a type of spire) as well as the addition of the chimeras on the Galerie des Chimères. During the Second World War, several of the stained glass windows on the lower tier were hit by stray bullets but were remade after the war. They now sport a modern geometrical patterns not the old scenes of the Bible. In 1991, a major program of maintenance and further restoration intended to last ten years was initiated. It included the cleaning and restoration of old sculptures which is an exceedingly delicate matter. By 2014, much of the lighting was upgraded to LED lighting. Among the first buildings in the world to use the flying buttress (arched exterior supports), Notre-Dame was not originally designed to include the flying buttresses around the choir and nave. However, after the construction began, the thinner walls grew ever higher and stress fractures began to occur as the walls pushed outward. To remedy this, the cathedral’s architects built supports around the outside walls. Later additions continued the pattern. Around the exterior, many small, individually-crafted statues, including the famous gargoyles and chimeras, were placed to serve as column supports and water spouts. Most of the exterior as well as the statues were originally vividly colored but the paint has since worn off, exposing the gray stone. As we were on a tight schedule, we didn’t have time to join the extremely long queue climbing several narrow (387 step total, no elevator) spiral staircases, in 3 stages, to the top of the 90 m. high South Tower. Upon reaching the top, it is possible to view, in close quarters, the cathedral’s Emmanuel Bell, the largest and most famous bell, the flying buttresses and its gargoyles as well as have a spectacular view of the Ile de la Cite. At Notre-Dame, there are 14 millions visitors per year or an average of 40,000 tourists per day.The area around the cathedral has lots of book stalls and cafes. One of several interesting things I did see around Notre Dame was the huge bronze equestrian statue of Charlemagne et ses Leudes (Charlemagne and his Guards), created by brothers Louis and Charles Rochet in 1878. Charlemagne, the King of the Franks and the emperor of the Holy Roman Empire from 800 A.D. until his death in 814 A.D., is holding a lance or staff while being guided by two leudes, which are believed to be the figures of Oliver and Roland. Also within the square in front of the cathedral is the Zero Point Marker where all mile markers start from. Notre Dame Cathedral: 6 Parvis Notre-Dame – Pl. Jean-Paul II, 75004 Paris, France. Tel: +33 1 42 34 56 10. Website: www.notredamedeparis.fr. Open daily, 7:45 AM – 6.45 PM (7:15 PM on Saturdays and Sundays). Photos without flash are allowed. For those who want to visit the South Tower (admission: 8,50 €, open 10 AM), the entrance is located outside the cathedral, on the left side of the front at Rue du Cloître Notre-Dame. Even with a Museum Pass, you still have to wait in line just like anyone else. There are also free organ recitals at 8 PM on most Saturday evenings. How to Get There: the closest Paris Metro stations to the Notre Dame Cathedral are St-Michel Notre Dame (RER B Train Line, blue), the St-Michel Notre Dame (RER C Train Line, yellow) and the Cité – Line 4 (fuschia). By bus, Lines n°21, 38, 47, 85, 96 (Stop Cité – Palais de Justice); Line n°47, Balabus (Stop Cité – Parvis de Notre-Dame); Lines n°24, 47 (Stop Notre-Dame – Quai de Montebello); Lines n°24, 47 (Stop Petit Pont); Lines n°24, 27, Balabus (Stop Pont Saint-Michel – Quai des Orfèvres); Lines n°24, 27, 96, Balabus (Stop Saint-Michel); and Lines n°21, 27, 38, 85, 96 (Stop Saint-michel – Saint-Germain). The rain had stopped when we returned to the mall and, after snacks at a MacDonald’s outlet at Jason’s Marketplace, the mall’s 1,000-pax basement foodcourt, Jandy, Isha and I exited the building to avail of this window of opportunity. We all walked, some distance, to a nearby park to appreciate the enormity and grandeur of the 357,721 sq. 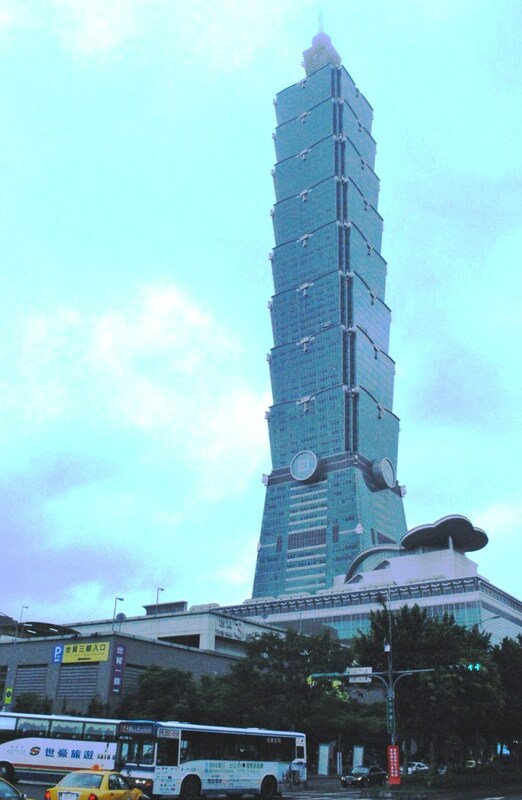 m. Taipei 101, the first record-setting skyscraper to be constructed in the 21st century. From afar, its repeated segments and inclined tiers simultaneously recall the rhythms of an Asian pagoda, a tower linking earth and sky (also evoked in the Petronas Towers of Kuala Lumpur, Malaysia)’ a stalk of bamboo, an icon of learning and growth (also emphasized by its blue green-tinted windows) or a stack of ancient Chinese ingots or money boxes, a symbol of abundance. In 2004 (until the opening of the Burj Khalifa in Dubai in 2010), Taipei 101, formerly known as the Taipei World Financial Center (until 2003), was officially ranked as the world’s tallest building, displacing the Petronas Towers in Kuala Lumpur, Malaysia (check out my visit here at http://worldstotrek.wordpress.com/2010/12/31/kuala-lumpur-new-years-day/), by 56.1 m (184 ft). It also displaced the 85-storey, 347.5 m. (1,140 ft.) high Tuntex Sky Tower in Kaohsiung as the tallest building in Taiwan and the 51-storey, 244.2 m. (801 ft.) high Shin Kong Life Tower as the tallest building in Taipei. That same year, it also received the Emporis Skyscraper Award. In July 2011, the building was awarded the Leadership in Energy and Environmental Design (LEED Platinum certification, becoming the tallest and largest green building in the world. Its own roof and façade recycled water system meets 20–30% of the building’s water needs. Curled ruyi figures, appearing throughout the structure as a design motif, are ancient symbols associated with heavenly clouds that connote healing, protection and fulfillment. 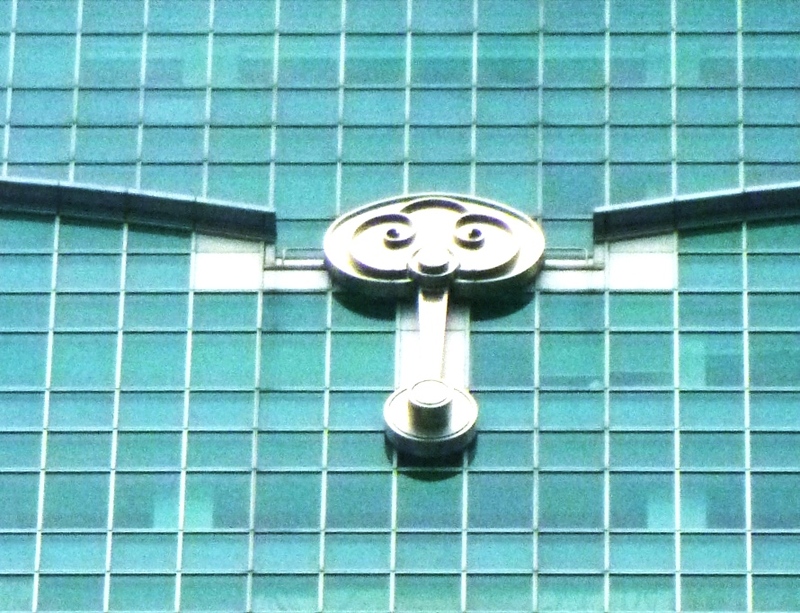 Each ruyi ornament on the exterior of the Taipei 101 tower stands at least 8 m. (26 ft.) tall. An icon of modern Taiwan ever since its opening, the structure appears frequently in travel literature and international media. Taipei 101 was designed by C.Y. Lee & Partners and constructed primarily by Samsung C&T and KTRT Joint Venture. It comprises 106 floors, 101 above ground and 5 floors underground. Ground to highest architectural structure (spire): 508 m. (1,667 ft.). Previously held by the Petronas Towers 451.9 m. (1,483 ft.), the record now rests with the Burj Khalifa in Dubai (UAE): 828 m (2,717 ft). Ground to roof: 449.2 m. (1,474 ft.). Formerly held by the Willis Tower‘s 442 m (1,450 ft), the record briefly passed to the Shanghai World Financial Center in 2009 which, in turn, yielded it to the Burj Khalifa. Ground to highest occupied floor: 438 m. (1,437 ft.). Formerly held by the Willis Tower 412.4 m. (1,353 ft.), the record also briefly passed to the Shanghai World Financial Center and then to the Burj Khalifa. . Fastest ascending elevator speed: designed to be 1,010 m. per min., which is 16.83 m./sec. (55.22 ft./sec.) (60.6 kms./hr., 37.7 miles/hr. ), 34.7% faster than the 12.5 m. (41 ft) per second (45.0 kms./hr., 28 mile/hr.) speed of Yokohama Landmark Towers‘ elevator, the previous record holder. Largest countdown clock which was displayed on New Year’s Eve (fireworks launched from Taipei 101 also feature prominently in international New Year’s Eve broadcasts). Tallest sundial: The design of circular Millennium Park, which adjoins Taipei 101 on the east, allows it to double as the face of a sundial. The tower itself casts the shadow to indicate afternoon hours for the building’s occupants. 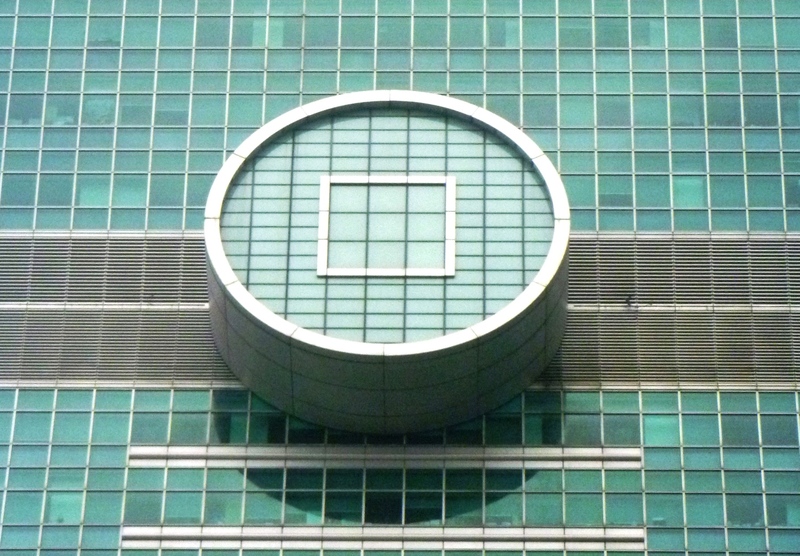 Taipei 101 is the first building in the world to break the half-kilometer mark in height. Taipei 101: Xin Yi Rd., Xin Yi District, Taipei City, Taiwan. Tel: (+886-2) 8101-7777. Website: http://www.taipei-101.com.tw.